There are many utilities being developed that you can jailbreak your iPhone devices such as Redsn0w and Spirit and just recently, a new utility named as Limera1n has been released targeted for iPhone 3GS, iPhone 4, iPad and iPod Touch 3G running on any version of firmware software from iOS 4.0 to iOS 4.1 (iPad from iOS 3.2 to 3.2.2). 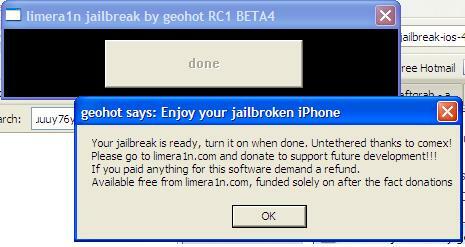 Limera1n uses bootrom-level vulnerability to jailbreak iDevices, although it’s different exploit from the SHAtter. As Limera1n had been released by GeoHotz, the much-awaited Greenpois0n jailbreak tool has been delayed in order to protect the secret of SHAtter bug. The best advantage is that Limera1n will work on all currently released and support devices forever, as it’s unpatchable due to the fact that Apple needs to redesign the hardware in order to patch the security holes at bootrom level. And the jailbreak by Limera1n is untethered, which means the devices do not need to be connected to computer to complete the boot after a reset. Warning though, do not use Limera1n for people who use the Ultrasn0w carrier unlock tool, as Limera1n will nonetheless update the baseband. iPhone Dev Team will release a new version of PwnageTool to incorporate the limera1n exploit so that baseband update can be avoided. The steps are pretty straight forward and even suitable for newbie that has not tried any jailbreak tools previously. Download Limera1n for Windows: limera1n.exe. It’s currently on Beta 4 and has been actively developed at limera1n.com. Connect the device (iPhone, iPad, iPod touch or Apple TV) to PC using USB sync cable. Click on “make it ra1n” button to make the device enters Recovery Mode. When the device is in Recovery mode, press and hold both “Home” and “Power” buttons to enter DFU mode. After about 10 seconds, release the “Power” button when the instruction is shown on Limera1n screen. Wait for the screen to show “in DFU mode…wait”, release “Home” button and let Limera1n does its job to proceed until “exploiting” followed by a “done” message pops up. Power on the jailbroken device, and on springboard click on Limera1n icon to install Cydia. Another alternative to Limera1n is Greenpois0n jailbreak.